Product #60530 | SKU 2-107 | 0.0 (no ratings yet) Thanks for your rating! 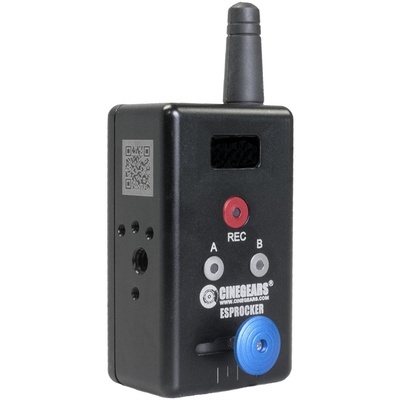 The Cinegears Single Axis Wireless Mini Rocker Switch Controller V2 is an updated V2 version has a newly designed "joystick" rocker for fine control over lens motors. Use the included USB cable to charge the Rocker Switch Controller's internal battery. On a full charge, the battery can last up to 8 hours, enough for most full-day shoots. In addition to the rocker, a record start/stop switch is also integrated for conveniently controlling recording. A and B switches let you programme end points for lens actuation. The built-in LED screen allows for speed control and status display. Use the mounting points around the aluminium chassis to attach the controller to your rig, or to other controllers to build up a multi-axis lens control.